Roller banners are one of the most popular choices for exhibition displays. The versatility of roller banners makes them perfect for most events, from small craft fairs to large B2B exhibitions. We offer a range of different banners that are ideal for a range of different uses. All of our banner stands utilise the same high-quality print and banner media, the main difference is the base. We also offer a Graphic Design Service for your printed roller banner. Our graphic design team can work closely with you to create artwork for your roller banner that meets your design requirements. 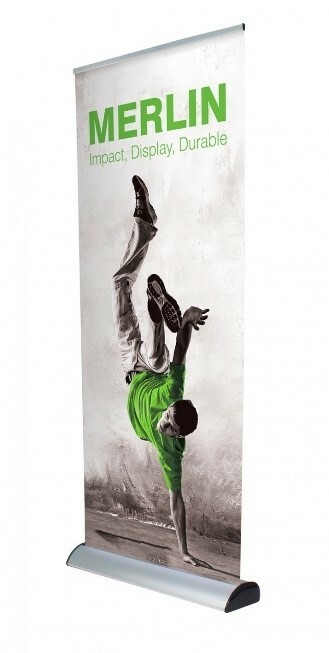 The Grasshopper is our best-selling banner and is an ideal budget choice whilst still providing a variety of features. The Grasshopper banner features a premium anodised aluminium base that the banner retracts into when not in use. For stability, two feet swivel out from the bottom of the base. A fabric carry bag is also included, making it easy to transport and provides protection for the banner during storage. Five different widths are available, including 800mm, 850mm, 1000mm, 1200mm and 1500mm. These sizes provide you with a range of options, ensuring you find something to suit your exhibition requirements perfectly. We also offer value packs for the Grasshopper Roller Banners, saving you money when buying more than one banner. Packs of 2, 5, 10, 20 and 50 are available. The 50 banner value pack provides a saving of £9 per banner, or £450 in total. These can all be printed with the same artwork, or you can have different artwork on each banner. A spotlight accessory is available for roller banners to illuminate your exhibition space and enhance your graphics. The Orient Roller banner is another popular, stylish banner available in our range. The aesthetically pleasing base is front-loading which means that the majority of the base is hidden behind the graphic, leaving you with a professional looking display. This banner is available in five widths, including 800mm, 1000mm, 1200mm, 1500mm and 2000mm. These options allow you to create an affordable, large-format display that is perfect for a variety of different events and exhibitions. The Orient also features non-protruding, adjustable feet which allow the roller banner to sit level on uneven surfaces. Also featured is a hybrid support pole, attached by bungee cords at the bottom with an adjustable section at the top of the pole, allowing for 550mm of adjustable graphic visibility. A carry bag is included with the Orient banner which allows for easy transportation and protection during storage. A 5 year guarantee is included on the base hardware. The Merlin is a unique banner with a graphic cartridge housed independently from the main base unit. This means you can replace the graphics yourself without having to return the whole banner to have new graphics fitted. Just purchase a new cassette and replace it with the old one. This banner is a cost-effective option if you change your marketing message and materials regularly. 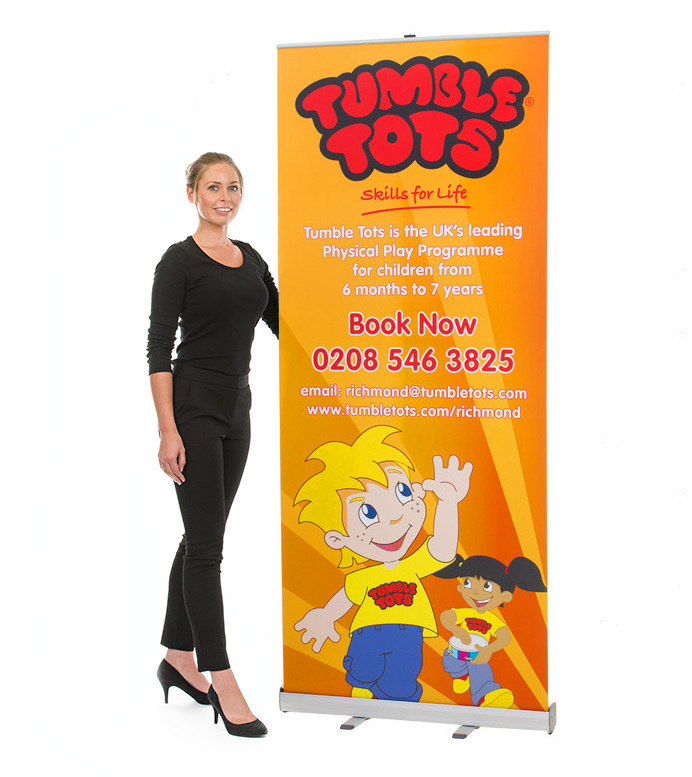 Ideal for use at exhibitions, trade shows, open days, advertising and marketing events. Similar to the Orient, the Merlin banner features a hybrid adjustable pole with bungee cord at the bottom and an adjustable top section which allows for up to 440mm of adjustable graphic visibility. This banner features a carry bag for convenient storage and transportation, as well as a 5 year warranty on the hardware. The Dragonfly banner is a popular option for double sided roller banners. This banner is ideal for medium traffic areas at exhibitions, trade shows, advertising and marketing events. The double sided graphics ensure your brand is seen from multiple directions. Each side of the banner can be used independently, allowing you to use the Dragonfly as a single banner display if required. The stand is easy to assemble and can be fully set up by a single person in just a few minutes, allowing for stress free assembly and disassembly. Two feet can be optionally twisted out from beneath the base to provide extra stability if required. The Dragonfly is lightweight and easy to use, with a carry bag included for easy transportation and protection from damage when not in use. 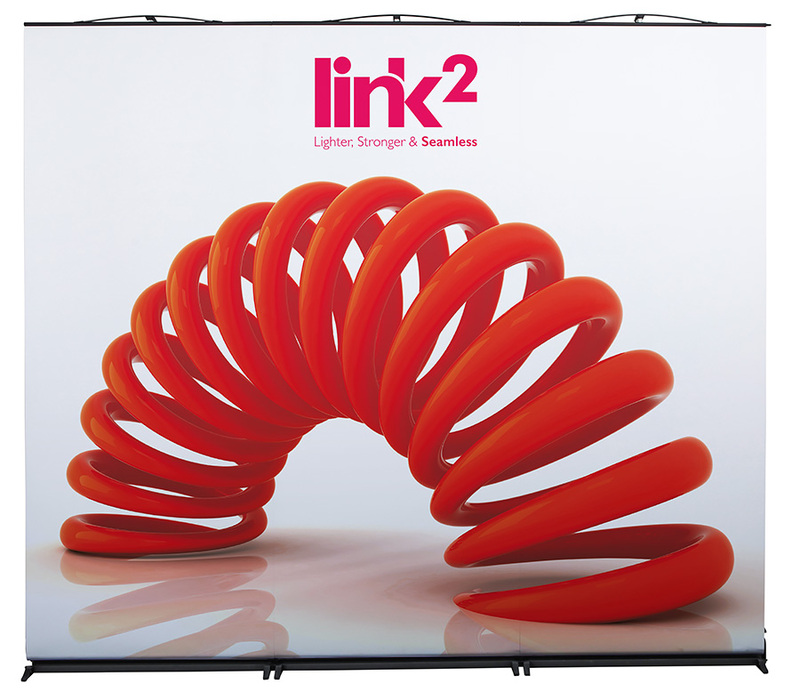 The Link2 is the world’s first fully linkable banner stand, offering your brand flexibility at events and exhibitions. We are one of only a handful of Link2 distributors in the UK. The ability to link these banners together seamlessly makes them ideal for creating backdrops as large or as small as you need for your exhibition space. No matter how big your display, it will always be simple and easy to set up and use. This banner stand is ideal for businesses that attend exhibitions on a regular basis and often change their marketing message and materials as the graphics are interchangeable. You can change the graphics yourself in just a few seconds with no fuss, and no need to send your banner off to the supplier to install new graphics. The Link2 features four twist out feet which provide extra stability, these feet are independent of each other, allowing the back feet to be folded flat so that the display can sit flush with the wall. 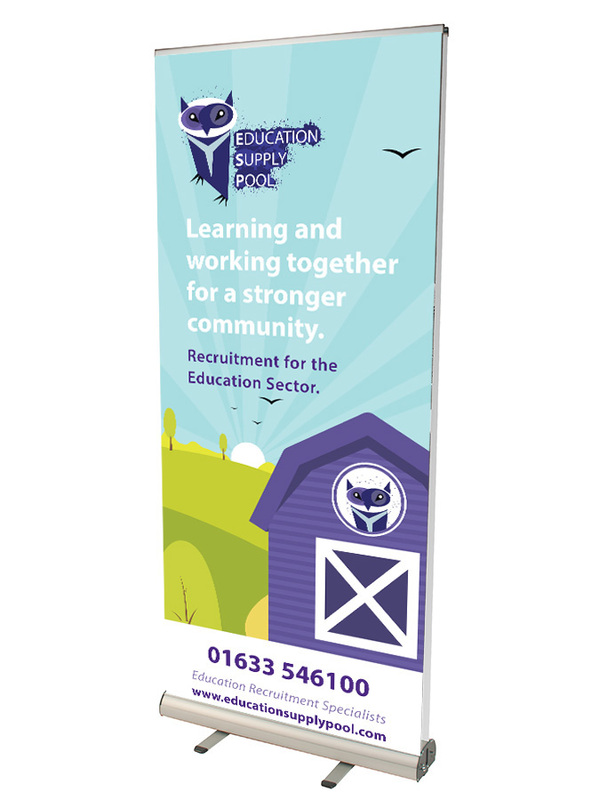 The Link2 banner is available as a single banner or in kits of up to three banners for convenience. If you’re looking to create a large exhibition stand using Link2 banners, contact us at 01733 511030. Customer Service – As winners of the Peterborough Business Awards 2015 – Customer Service Award, we are proud of our high quality customer service. Be assured we will be there to assist you through every step of your order. At XL Displays we are experts in exhibition stand design and provide everything from custom exhibition stands to portable display solutions such as pop up stands, roller banners and promotional counters. For more information, contact us or call us on 01733 511030.